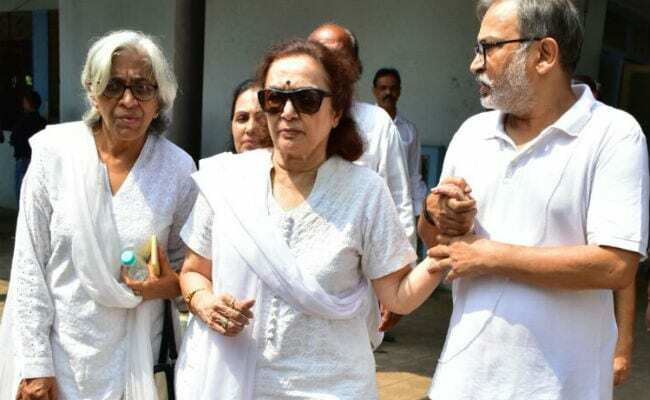 "The last 8-9 years of Shammi Aunty's life were miserable"
Veteran actress Asha Parekh whose best friend Shammi died this morning, was 'inconsolable' at her funeral, reported news agency IANS. Reminiscing on their fond memories, Asha had told IANS, "I haven't wept so much since I lost my parents. I called her Shammi Aunty. She was much older than me. But we were best friends for years. She shared everything with me. It was a natural-born trait in her to win people's confidence. Shammi, who was alone in her last days, lived a few apartments away from her adopted son Iqbal Rizvi. She and her husband Sultan Ahmed did not have any children. Shammi was 89. Asha and Shammi's bond of friendship has withstood the tests of time. Speaking about which Asha Parekh told IANS, "She was close to many actresses who poured their heart out to her. With me, it was special. We had spent decades together. She was my closest friend, confidante and, after my parents' death, a guardian angel. Now she's gone." Shammi was best friends with Bollywood first superstar Rajesh Khanna, Sunil Dutt and Asha Parekh. All three of them, had worked in projects helmed by Shammi's husband Sultan Ahmed. Asha recalled, "I did Sultan Ahmed saab's Heera only because of Shammi Aunty. The laughter stopped when she was about 80. The last 8-9 years of Shammi Aunty's life were miserable. Her health was failing. And she often had no domestic help. She would come and stay with me. We couldn't share as much laughter as we did earlier since her hearing faculties were affected," IANS quoted her as saying. Sunil Dutt's daughter Priya Dutt mourned 'Shammi aunty's' death on Twitter and wrote: "Shammi, aunty to me and a great actor of yesteryears passed away today. She was my mother's dear friend and someone we all loved very much. May her soul rest in peace and her laughter and contagious smile rock the heavens. Be In peace with your friends." Priya also attended Shammi Aunty's funeral in Mumbai. Shammi had featured in over 200 Bollywood films. She was last seen in Shirin Farhad Ki Toh Nikal Padi, also starring Farah Khan and Boman Irani.